A four-year contract worth UK£42 million ($54.87 million) has been awarded to BAE Systems to provide ongoing support for the Royal Air Force’s fleet of four British Aerospace 146 transport aircraft. They are operated by No. 32 (The Royal) Squadron from RAF Northolt, located in west London. Included in the contract—which commenced on March 1 this year—are one- and two-year extension options. If the latter is exercised, the value rises to £60 million. Formally known as the BAe 146 In-Service Support Availability Contract, the deal was put out to tender and won by a BAE Systems-led team that includes the previous 146 support contractor, Serco. With an experienced workforce and mature facility at Northolt, Serco is responsible for the maintenance aspects, including support of airframe, powerplant, avionics, and electrics. The company also performs aircraft interior cleaning and maintenance and provides total supply chain management. It also manages the GFA (government-furnished assets) that are part of the 146. Serco provides a pool of sponsored reserve personnel that are available to support the aircraft when it is deployed overseas. For its part, BAE Systems is responsible for delivering the aircraft availability element of the contract, which will drive a 20 percent increase in availability at a reduced operational cost. The contract specifies that three out of the four aircraft will be available for tasking at 7 a.m. every weekday, and two of the four will be available at 7 a.m. on weekends. 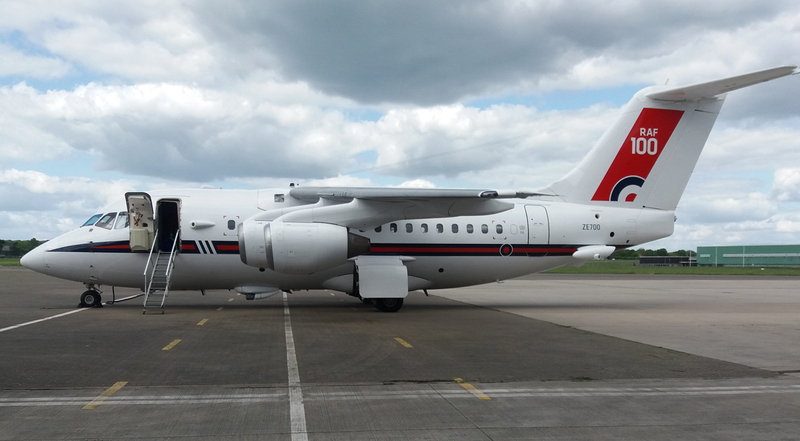 The RAF has operated the BAe 146 since 1986, when two 146-100s were assigned to the Queen’s Flight at RAF Benson, designated 146 CC.Mk 2 in RAF service. A third was added in 1990 but was sold in 2002. On April 1, 1995, the Queen’s Flight was merged with No. 32 Squadron at Northolt, which undertook staff transport duties as the Metropolitan Communications Squadron. Upon the unit merger, No. 32 added "The Royal" to its title. From that time the 146s ceased to have a dedicated royal transport commitment and were assigned the Command Support Air Transport (CSAT) mission. However, members of the Royal family can—and do—use the aircraft if they are not required for military missions. In 2004 the distinctive Queen’s Flight red-tail livery was removed, primarily as a security measure. No. 32 Squadron’s 146s have been used for intra-theater passenger and cargo transport during wartime, including in Desert Storm in 1991, and more recently in Iraq and Afghanistan. The demand for such capacity to reduce the burden on the Hercules and Chinook fleets led to the acquisition of two more aircraft in 2013. The ex-TNT aircraft are of the 146-300QC (Quick Change) version, with a large freight door in the rear fuselage for loading and unloading palletized passenger seats and freight. They are designated 146 C.Mk 3 in RAF use. All four aircraft are fitted with a defensive aids suite for in-theater operations, or when transporting VVIPs.